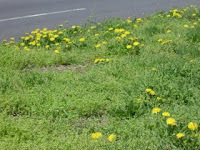 Each spring, toward the end of April, little yellow flowers pop out of the ground all over. 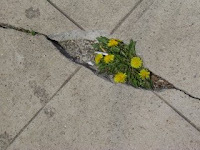 Dandelions are cute, and I've always associated them with the official arrival of spring weather. This also coincides with the peak of my allergy suffering for the year. After all, these life-forms are weeds. Their adorability does not coincide at all with their purpose, which is to mature and spread their fluffy white seed packets through the air. The yellow flower, made of all these petals, actually closes up at night. I discovered this on wikipedia, since I'd never gone out at night to look for them, but did notice all the little stalks one night along the nearby boulevard known as Ocean Parkway, in Brooklyn. Interestingly, and oddly, information online says dandelions have been used to make salad, wine, mosquito repellant, and even a diuretic. They contain antioxidants, but there is also caffeic acid, which has said to possibly be carcinogenic; just what a germophobic hypochondriac such as myself wants to hear! 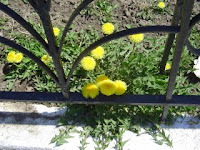 So inside the dandelions, there are carcinogens and antioxidants; these plants have it all. So I guess this hardens the plants to be able to grow anywhere. The garden in front of my house is filled with gritty, dead soil, but they grow there. They even grow out of cracks in sidewalks, and in the polluted grass along Ocean Parkway - millions of them along the side paths from one end to the other. I wouldn’t be surprised if they can even grow out of nuclear waste and survive. In a worldwide catastrophe, I’m sure dandelions will make for a scenic environment for the cockroaches to thrive in – unless they too have allergies. Washington D.C. – In response to rising viewer sentiment, the FCC has proposed a limit on the length of time a network can feature a Breaking News label onscreen, according to a report released yesterday by the Non-Associated Press. According to the new FCC law, the limitations will require the Breaking News label to be removed once 5 hours and 15 minutes have passed since a labeled major event, such as those related to war and homeland security issues. For minor issues, such as criminal acts and non-major natural occurrences, the time limit is reduced to 3 hours, providing no major breaks in a story really do occur. Additional regulations state that a breaking news item must be displayed directly below the label, which cannot be placed solely for marketing purposes. News sources such as CNN and FoxNews, among others, have labeled news elements constantly with the Breaking News label, according to a report from the FCC released last week. A bombing in Baghdad earlier this month had been labeled as such onscreen for up to 27 hours after it occurred. Unconfirmed reports have stated Breaking News labels have remained onscreen for as many as 3 days following an event. “We are concerned about this viewer sentiment in that the American people need to have accurate and honest reporting. The legitimacy of many major news networks is at stake here,” said FCC Commissioner Deborah Taylor Tate. “I honestly don’t know when anything really happens, they just give me things to read and I do,” CNN’s Wolf Blitzer told Embellished-1 News in an exclusive interview.